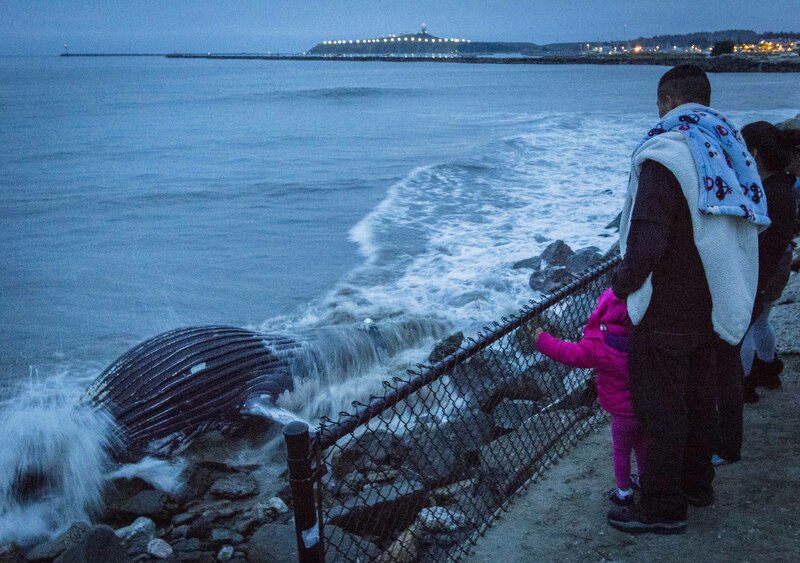 Like a bad penny, the dead humpback calf that had washed out to sea returned again to a beach north of Half Moon Bay. And so did the spectators, in droves. News reports, word of mouth, and of course Facebook posts drew more people than the previous day. While I’m still fact-checking, it seems that the whale did finally get examined by marine scientists, who determined that it was a female, but did not (could not?) determine a cause of death. And it seems that afterwards it was pulled out to sea behind a boat. I sincerely hope that many of the folks for whom this whale-viewing was a first will be inspired to go whale watching on a boat. Those of you who have gotten close to whales on the open ocean know what I mean. It’s there that you can appreciate how big they are, and how quickly yet elegantly they can move through the water. May all your whale sightings be live ones!